Interested in pursuing your degree through the Advanced Inquiry Program? Join us for an informational forum on November 13! Woodland Park Zoo (WPZ) has teamed up with Project Dragonfly from Miami University in Oxford, Ohio to offer the Advanced Inquiry Program (AIP), an exciting Master’s program for a broad range of environmental and education professionals, including classroom teachers, zoo and aquarium professionals, and informal educators. The AIP offers a ground-breaking graduate degree focused on inquiry-driven learning as a powerful agent for social change, public engagement, and ecological stewardship. Woodland Park Zoo is one of eight institutions across the country that offers the AIP Master’s. The first AIP cohort at WPZ started in 2011 (many of whom are graduating this December!) and students have already reported positive changes in their personal and professional lives. We asked Carole Parks, AIP graduate student and an instructor with the Community Colleges of Spokane, to illustrate the impact that this program has had on her teaching, her community, and her life. AIP graduate students hiking to Dutch Henry Falls with Chuck Warner, Arid Lands Program Director, The Nature Conservancy. Photo: Kelly Frazee/Woodland Park Zoo. WPZ: Why did you apply to the Advanced Inquiry Program (AIP)? Carole: I've always dreamed of studying zoology. When I was growing up in San Diego, we would frequent the zoo there and we would never miss Omaha's Wild Kingdom TV program. Wildlife has always fascinated me and doing something on behalf of wildlife, such as addressing climate change, makes me feel empowered. When the AIP opportunity came up, it was a natural fit. Carole: This program has enriched my life deeply. On a personal basis, it has been a source of joy and hope in a difficult time in my life. It's very motivating to work on something that I feel so passionate about... and it's downright fun when we have face to face days at the zoo or in the field. I participated in our Northwest Wildlife Conservation course this summer, where we engaged in four days of learning about and participating in wildlife conservation in Washington’s Columbia Plateau. 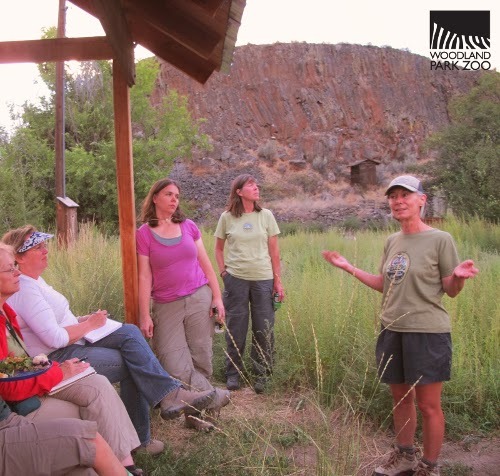 We met farmers working to incorporate sustainable practices in their agriculture as well as land managers from the Nature Conservancy and Washington Department of Fish & Wildlife biologists working on pygmy rabbit recovery and golden eagle conservation. We answered our own questions about the area through inquiry investigations of the area’s wildlife and habitat. Carole Parks, AIP graduate student, assisting Washington Department of Fish & Wildlife biologists in taking tissue samples from a pygmy rabbit in the Sagebrush Flats recovery area. Photo by Tracey Byrne. We also met Nancy Warner, coordinator with the Initiative for Rural Innovation and Stewardship, who was very inspiring. She helped us challenge ourselves to involve our communities in our local projects. AIP graduate students meeting Nancy Warner, coordinator with the Initiative for Rural Innovation and Stewardship, at McCartney Creek Meadow. Photos by Katie Remine/Woodland Park Zoo. 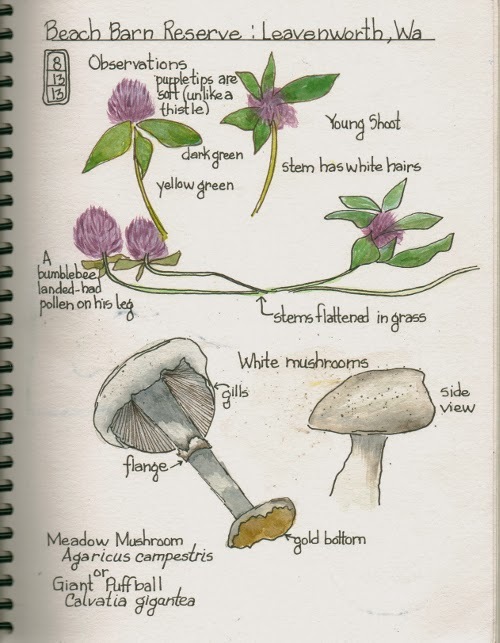 We kept field journals during this experience and even though I love to journal, this assignment stretched me in a meaningful way. I've been trying to grow in my drawing ability, so this particular assignment was inspirational. The coursework never ceases to interest me and make me even more curious about the world around us. On a professional level, I teach adult education, much of it developmental education or GED. It has been exciting to be able to implement many of the things I have learned, both content and process, in my classroom. There's nothing better than seeing the "aha" on my students' faces when they understand a science concept that they may have previously struggled with. They also catch my passion. For instance, I taught a lesson about the expense and environmental impact of buying bottled water. They said "Hey! How come this is not on the news? Everyone needs to know this!" 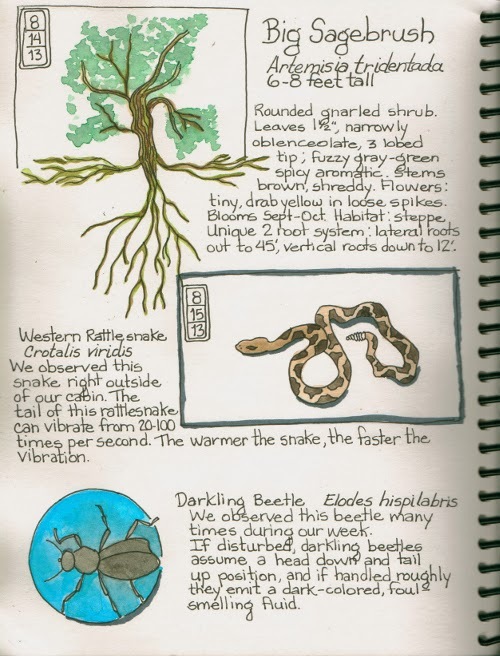 Another professional perk is that I participate in citizen science wildlife monitoring, which I hope leads to some paid fieldwork someday, maybe during the summers! I don't think I would want to give up the influential position of being a teacher! Carole: In the beginning of the program, I really thought hard about this question. What kind of impact did I want to have on my community? After all, knowledge without action is pretty worthless. So I decided to focus on a local, urban park: Drumheller Springs, in my hometown of Spokane, Washington. It started out as a website for the Biology in the Age of Technology class, but it has developed into much more than that! I am now doing active research in the park and hope to publish a paper in the next year! 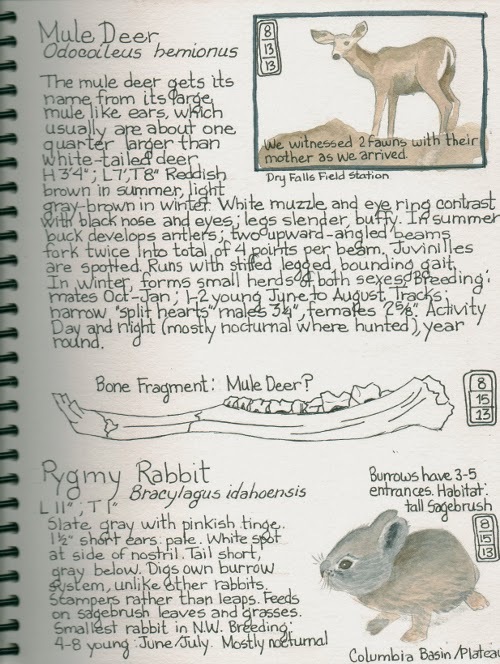 We have some heritage plants with Salish names and traditional medicinal uses, thanks to collaboration with my Spokane Tribal friend, Barry Moses, and we hope to get some audio clips with Salish narrative on the website. The native historical aspect of the park is a highlight and is great for visitor information. Now my website is the first that comes up when you put Drumheller Springs, Spokane into a search engine! It's all very exciting and I can't wait to see how this website develops in the future. I am very proud of the education I am receiving at Woodland Park Zoo and Miami University of Ohio. I already have a MS in education, so the addition of this degree will lead me to even more exciting work. I would encourage anyone who even has a slight interest to check out this program, it's one of the most amazing things that has ever happened to me! Please join us for our informational forum about the Advanced Inquiry Program! Wednesday, November 13, 6:00 - 7:30 p.m.
Woodland Park Zoo Education Center. This informational forum includes snacks and a live animal presentation! Check out the Advanced Inquiry Program page on the zoo’s website for more information: Applications for the Advanced Inquiry Program are accepted until February 28, 2014 for summer enrollment. For more information or to apply, see Project Dragonfly’s website. 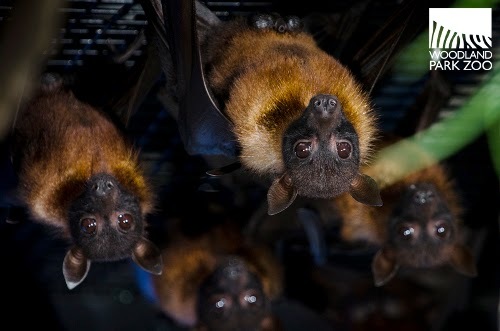 Riddle me this, bat lovers: is there anything more awesome than a close up view of a colony of Indian flying foxes? Watch the Bat Cam now! 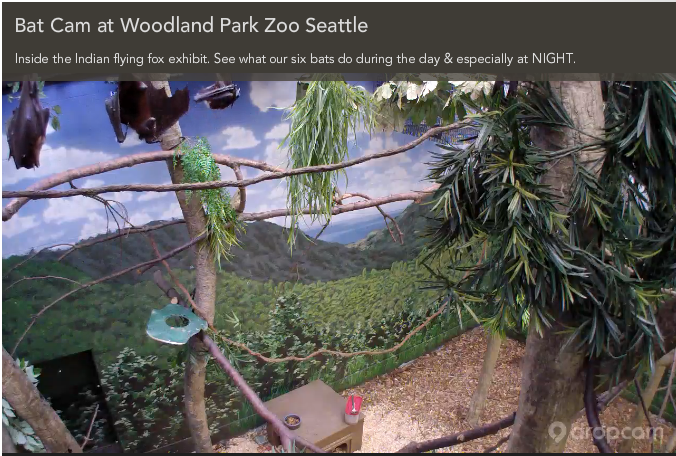 This Halloween, we're introducing the newest Woodland Park Zoo webcam, streaming live 24/7 from the Adaptations Building. Now you can check in on the roost of furry winged Indian flying foxes all day, or all night if you want! Watch the colony of six male fruit bats as they dine, groom each other and chill out upside down. The crew hanging out in the Adaptations Building. Photo by Ryan Hawk/Woodland Park Zoo. 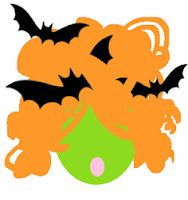 In celebration of the new webcam, and because bats need love all year (not just at Halloween! 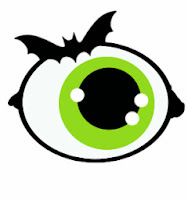 ), let’s take a closer look at the awesomeness of bats and why they need your support. There are about fifteen species of bat found in Washington alone, including the big brown bat many know, and bats with catchy names like hoary bat and Myotis evotis. With so many bats in our backyard, it’s time you learned more about them. How did bats become associated with Halloween, evil spirits and vampires? Since bats are mostly nocturnal, and tend to be somewhat elusive, their unfamiliarity with people is probably the only reason we have to fear them. Thanks to Bram Stoker, the author of the novel Dracula, and generations of bat folklore, the stigma associated with bats has continued. However, the mythology surrounding bats isn't all witches and vampires. Many cultures choose to think of bats as omens of good luck. You will find that bats are remarkable creatures that play a major role in our well-being and deserve our support. We aren’t saying vampires don’t exist, especially in the Pacific Northwest’s murky rain forests (ahem, Forks), but we can guarantee that bats are certainly not going to drain your blood or hypnotize your girlfriend. The tradition of associating bats with vampires and other monsters has been around for a very long time. But, let’s not blame this nocturnal animal for our very human fear of the dark. Now, there are some species of vampire bats in Central and South America. They make small incisions in animals and lap up blood; however, they do not usually target people and they most definitely do not do the work of Dracula. Nope, not at all! Some bats use echolocation, a sophisticated sonar system that most certainly puts our best map apps to shame. Fruit bats, like the Indian flying fox, have large eyes and are able to see fruits and flowers in the dark. No need to worry about a bat finding its way around. Yes, your hair is really cute. The time you spend straightening and curling your hair has paid off, you look fabulous. But trust us—no bat, ever, has voluntarily decided to dive into your locks. Bats are equipped with spectacular navigational capabilities that allow them to fly through the dark and catch tiny insects. They are 100% able to steer clear of your coif, unless you are harboring mosquitoes in your hair, in which case you can thank the bat for taking care of that for you. Myth 4: Bats are flying rodents. Nope. 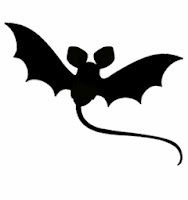 In fact, bats are closer in evolution to primates than rodents. So, flying monkeys? Not really. Bats are the only true flying mammal and have incredible adaptations which allow them to live all over the world in all sorts of diverse environments. Bats represent 20% of all mammals with 1,240 unique bat species. Bats spend a lot of their time cleaning each other and meticulously grooming. While any wild animal has the potential to contract rabies or other diseases, bats are no more likely carriers than a raccoon or a squirrel. Like any wild animal, it is best not to touch them. Bats voluntarily eat up to 600 mosquitoes an hour, while you are sleeping, protecting us from malaria, West Nile Virus, dengue and yellow fever. What do you do for bats? Bats help keep insects numbers down. They are a natural pest control and play a big role in helping pollinate flowers and fruit trees. Many ecological benefits come from bats. Oh, Hollywood, the perpetuator of the evil bat trope. In western culture, bats are indeed associated with mysterious, scary or haunted landscapes, but elsewhere they are a sign of luck. In Chinese culture, the bat is an auspicious Feng Shui symbol for prosperity, happiness and longevity. 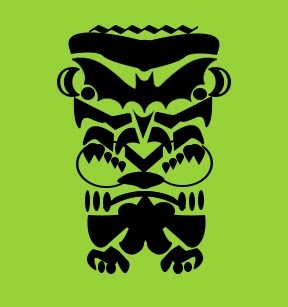 In many Native American cultures, bats symbolize intuition, vision, family and communication. In some villages in India, the bat is sacred and protected from harm. Fear and superstition can be terrible for any species, but especially when that species is threatened or endangered. Bats are in danger. Their populations are under threat across the continents, including right here in North America. For too long the urgency of this problem has been ignored because bats are less popular and less understood than some of the other charismatic animals at the center of many conservation campaigns. But bats are essential to the web of life as pollinators and pest controllers and it’s time we take action for them! White nose syndrome, a devastating fungus, has killed 5.7 million bats and infected 7 species since it was discovered in 2006. The fungus disrupts the bat’s hibernation, causing the animals to leave their roosts prematurely, fly into the winter cold and either starve or freeze to death. 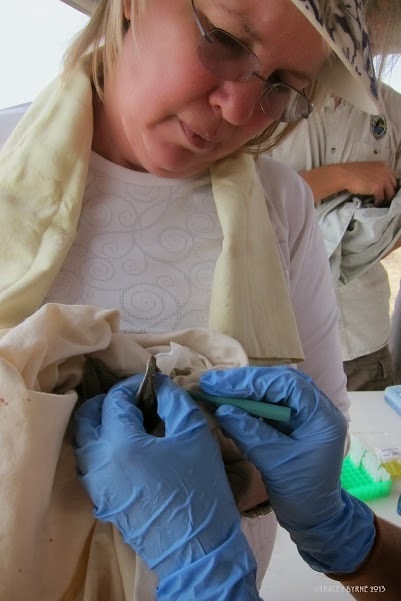 Researchers are working to understand WNS and begin restoring these bat populations. Wind turbine disruption poses a large threat to bat populations within the U.S. Partners from conservation organizations, U.S. Fish and Wildlife and the American Wind Energy Association are working together to prevent further damage to these bat species. Habitat destruction, including filling in or closing off abandoned mines, urbanization (noise, light and air pollution), and human disturbance can all jeopardize a roost. Bats are collected and eaten as food in many areas of the world. Cave roosts are lost to improper guano mining, recreational caving and the commercial harvesting of swiftlet nests used in bird-nest soup. 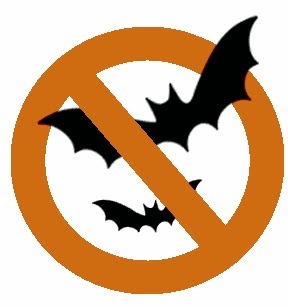 Habitat destruction, roost disturbance, and reckless eradication efforts continue to place many bats in extreme peril. Defend bats! 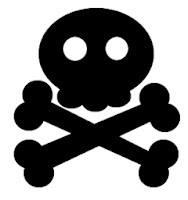 You have the power to fight back. What can you do to answer the bat call? Stay batty! The most important thing you can do to help bats is to love them. Fear and misunderstanding about bats aren’t going to help them. Educate your friends and family about all the good things that bats do for us. Provide habitat for bats in your own yard. Leave hollow trees and snags standing or install a bat house. Bat Conservation International has a great DIY bat house tutorial. Visit the bats at Woodland Park Zoo and support conservation groups, especially those in the Pacific Northwest and internationally, like Bat Conservation International, a zoo Wildlife Survival Fund project. 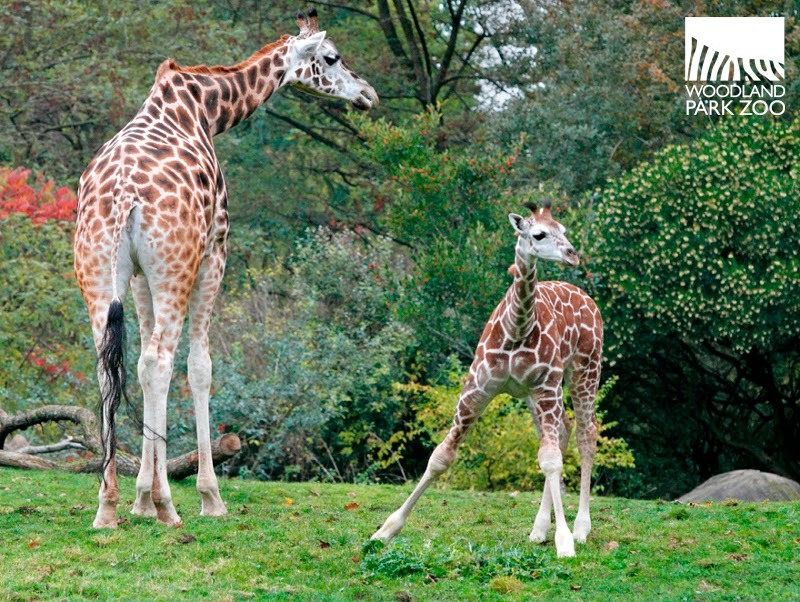 At almost three months old, it’s time for giraffe calf Misawa to stretch his long legs. 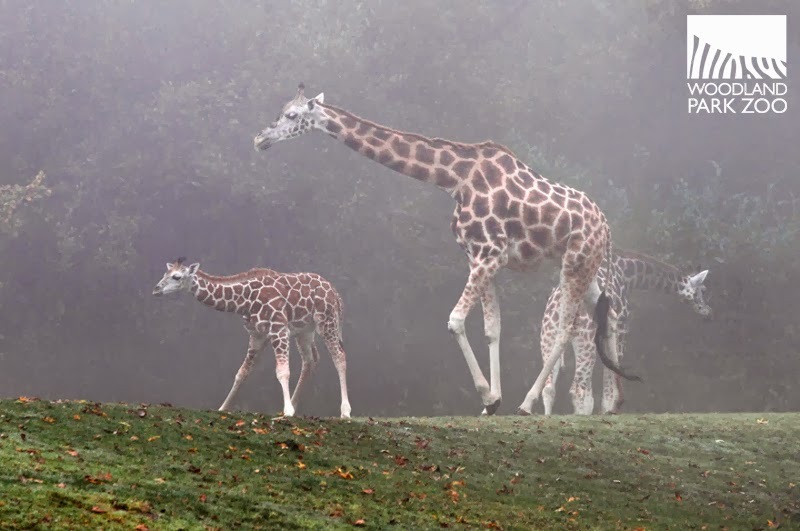 Keepers have begun to give the giraffe calf, his mom Olivia and aunt Tufani access to the savanna for short introduction sessions on warmer days. Last week Misawa took his very first steps onto the savanna exhibit. On day one, all the animals were cleared from the savanna except the easy-to-get-along-with gazelle and ducks. It was a foggy morning when Misawa emerged through the mists to find a world full of new sights, sounds and tastes surrounding him. He stuck close to mom’s side at first, but curiosity took over and he began to check out what the rest of the savanna had in store for him. Day one didn’t last much longer than an hour, but he has been spending more and more time outside as the introductions continue. For now, these introductions don’t follow a set schedule. We track the weather and offer brief sessions when the days have high temperatures of 50°F or are especially sunny and dry. Now that Misawa has had a few positive first days on the savanna, we’re adding new experiences to get him acquainted with all his neighbors. Yesterday morning, the sun came out and keepers opened the gate to let Misawa cross over from the barn to the savanna, which he did with enthusiasm. Of course, he didn’t know he’d be meeting a new cast of characters! When he emerged onto the savanna this time, he saw patas monkeys in the distance, and encountered his horned neighbors, the oryx, for the first time. Misawa played it cool around the oryx—he was curious, but rather than approach them directly, he’d steal surreptitious glances at them from behind where they couldn’t see him. Not that the oryx were all that interested in him—getting food and napping in the sun seemed to occupy their minds. Soon he’ll meet the zebra, and last he’ll encounter the ostrich. For now, we’re helping Misawa grow comfortable outside by letting him explore at his own pace without too many distractions or elements of surprise. Tufani and Olivia are enjoying their time out on the savanna as well. They keep an eye on Misawa but aren’t overprotective. He may wander off and explore in another direction than them. They’ll do an occasional check, glancing in his direction to make sure he’s OK, and continue munching their way through the savanna. Though Misawa is never far out of their sight, he has another safety net—zookeepers have baby proofed the exhibit! 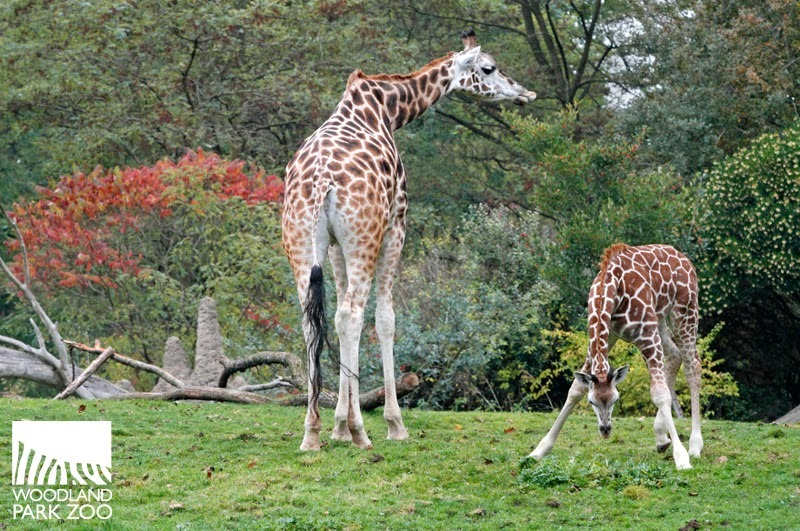 How do you baby proof a savanna for a spindly calf? 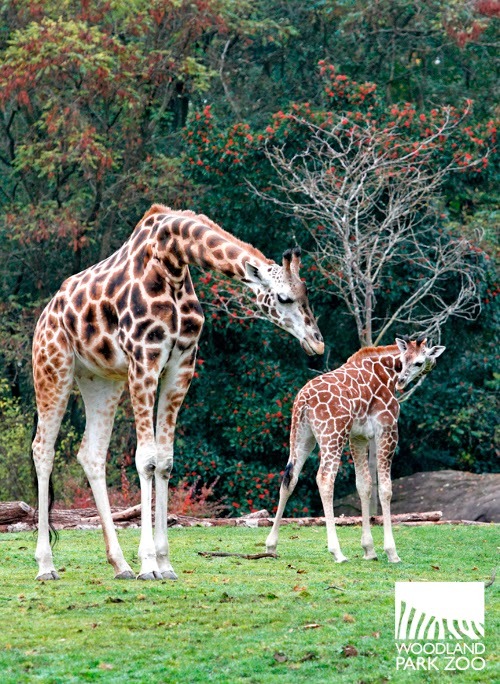 Lay out some branches along steeper slopes to act like baby bumpers, and close up any gaps into which a curious giraffe calf might want to wedge himself! He towers over 7 feet tall, but Misawa can’t quite reach the tree tops yet. Much of his time on the savanna is spent looking around and browsing the ground. 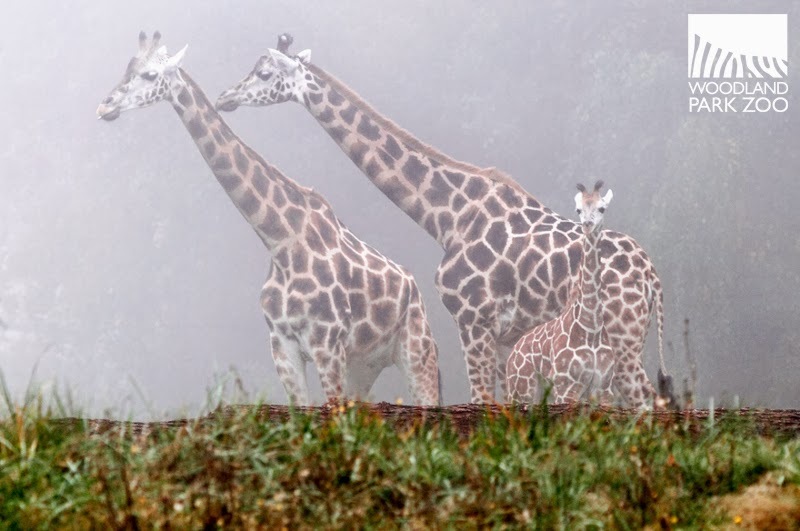 If you’re lucky, you’ll spot Misawa in action on the savanna on your next visit during a warm, dry day. As the season turns, his time out there will become less regular, thanks to the whims of the weather. 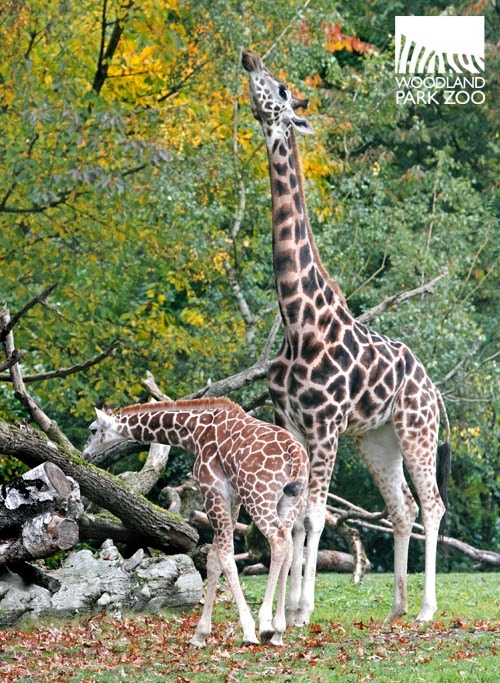 But you can always look for Misawa and family in the Giraffe Barn, or check in on them on the Giraffe Baby Cam. Armed with a tiny toothbrush, zookeepers are determined to give our gila monster some minty, fresh breath. 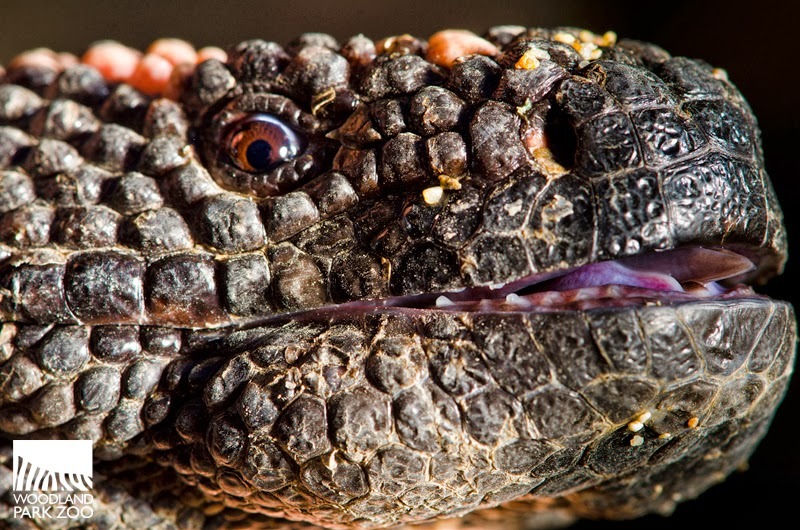 Gila monster extreme close-up. Photo: Ryan Hawk/Woodland Park Zoo. 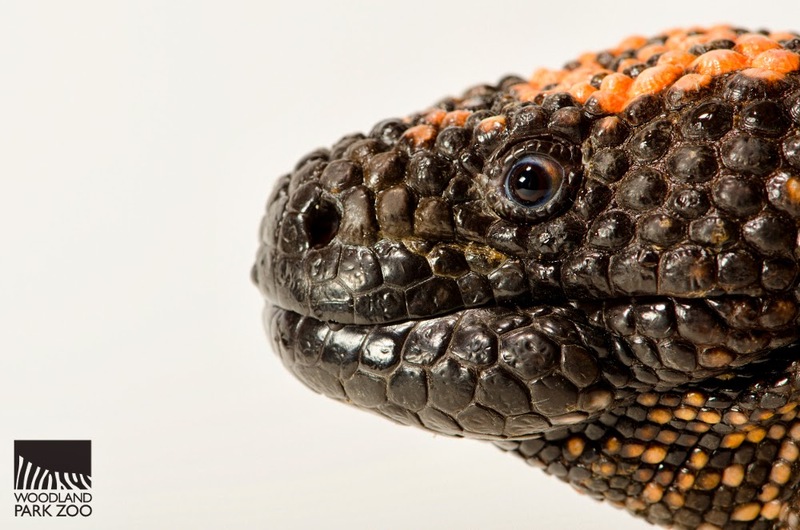 We don’t recommend trying this at home—gila monsters are one of only a handful of venomous lizards—but do watch what it takes for the keepers to ensure the oral health of an aging, 43-year-old male gila monster here at Woodland Park Zoo. Video: Monster gets his teeth brushed. Produced by Kirsten Pisto/Woodland Park Zoo. 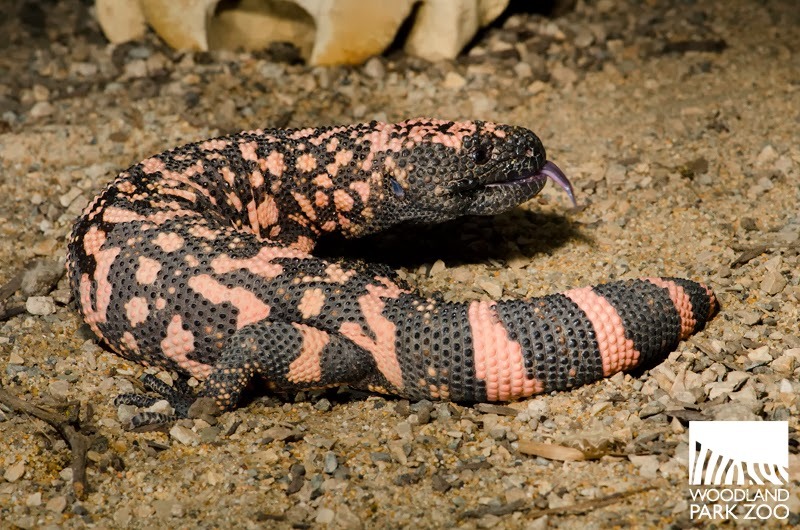 The tooth brushing and regular antibiotics help with the gila monster’s gingivitis and gum inflammation, not uncommon in aging lizards. As you can see in the video, he’s quite cooperative, allowing one keeper to hold him in place while the other gently brushes. The toothpaste leaves him with that fresh-from-the-dentist gleam. When placed back into his exhibit, he always takes a big drink of water as if to rinse! Back on exhibit. Photo: Ryan Hawk/Woodland Park Zoo. As his oral health improves, we probably won’t need to brush his teeth as often. But he seems to enjoy the experience and is quite cooperative, so we’ll keep it up at least some of the time as part of his ongoing care. Credit goes to our incredible team of zookeepers and veterinarians for assessing this old reptile’s mouth troubles, coming up with a treatment plan, and committing to the care day in and day out with extraordinary patience and dedication. That’s one lucky, fresh-breathed monster! Fresh to death. Photo: Ryan Hawk/Woodland Park Zoo. Keeping our animals’ mouths in good health is an important part of providing them with the best care. Take a closer look at animal teeth in this Delta Dental of Washington article to see what we’re working with. 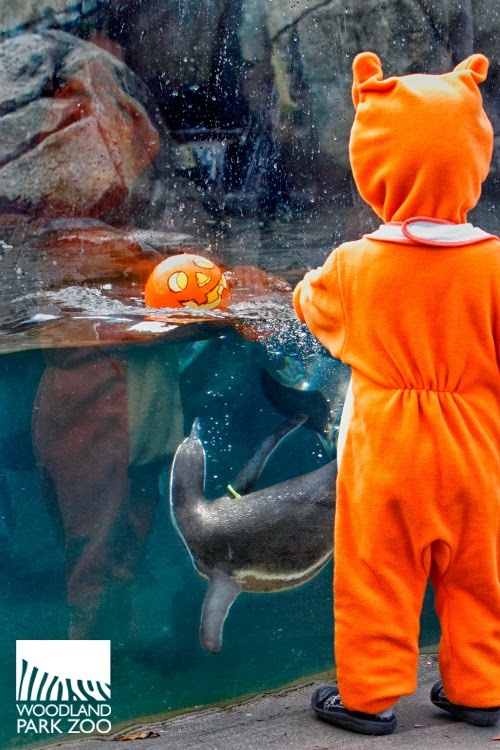 Trick-or-treaters are in for some fun at the zoo. Photo: Ryan Hawk/Woodland Park Zoo. Pumpkin Bash presented by Delta Dental of Washington is coming up Oct. 26 & 27. There will be trick-or-treating, and don’t forget to stop by the Delta Dental booth for a little treat and to learn more about keeping your own mouth gleaming even after you eat all that Halloween candy. The Elephant Task Force—the citizens committee that has been evaluating our zoo’s elephant exhibit and program, including a health assessment of our elephants Chai, Watoto and Bamboo—has just released their final report. I wanted to make sure that you had the opportunity to review the report for yourself. In the report, you’ll find that the Task Force has unanimously adopted the medical assessment by the Expert Review Panel that recognizes the good health and well-being of our elephants, as well as providing multiple options for even better accommodations for our elephants. The report recognizes that the elephant program plays a vital role in the zoo’s conservation mission and concludes that the program efforts should continue and consider further expansion to provide even more value to conservation education. 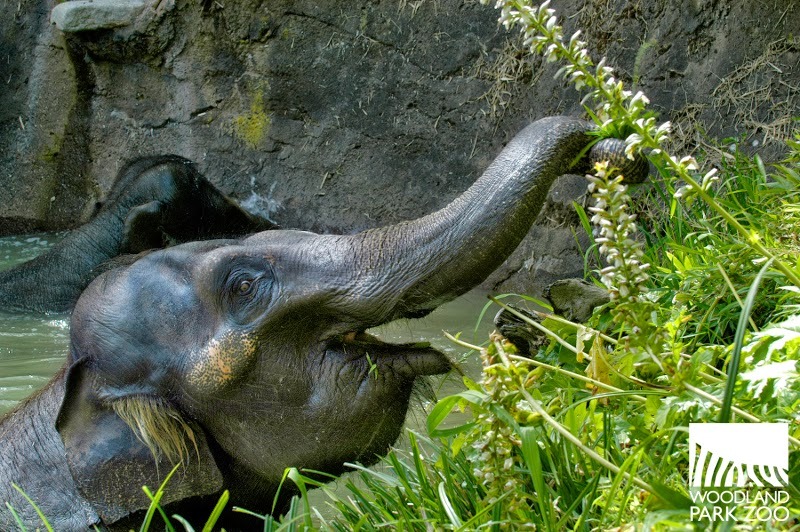 Chai, an Asian elephant at Woodland Park Zoo. Photo: Ryan Hawk/WPZ. What’s next? 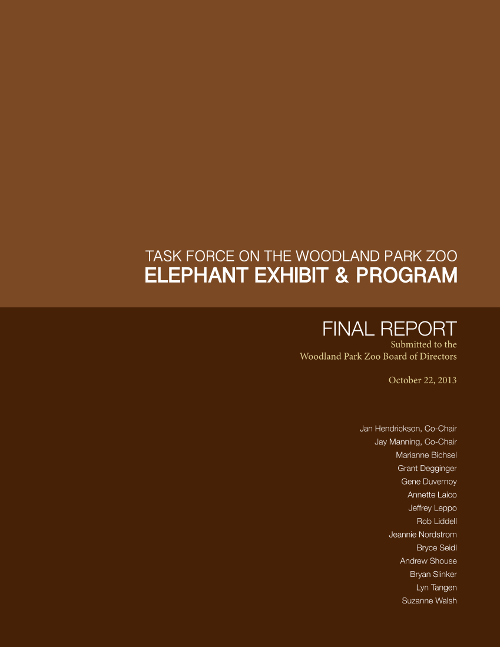 Now that the Task Force has completed its charter and issued their final report, the zoo’s board and staff will spend time thoroughly reviewing the findings. We expect to make decisions in early 2014 that will guide the future of our elephant program. We’re passionate about providing excellent care, visitor experiences that engage and inspire and conservation support across the globe, values I know you share. You can expect that, as with all of our animal programs, we’ll make decisions based on what is best for the animals, the zoo and the community. 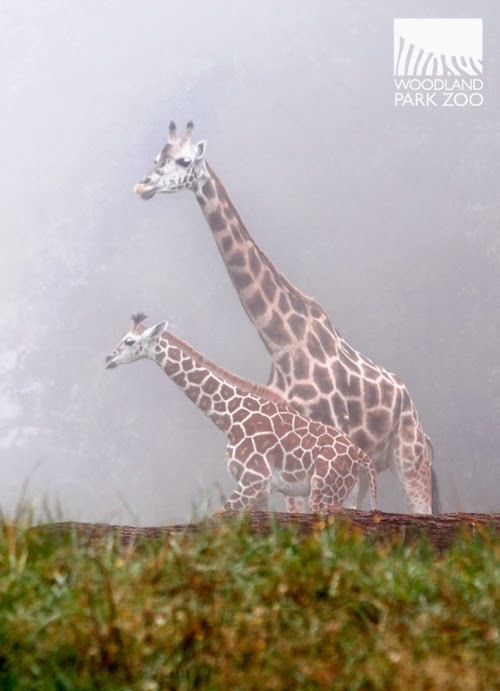 Through your support, you have made Woodland Park Zoo a world-class zoo. You make it possible to serve a community that is so deeply committed to our shared vision of a world where people, wildlife and wild places thrive together. Thank you for your continued support and friendship. You can share your thoughts with us here, by email, or join us online on Facebook or Twitter. 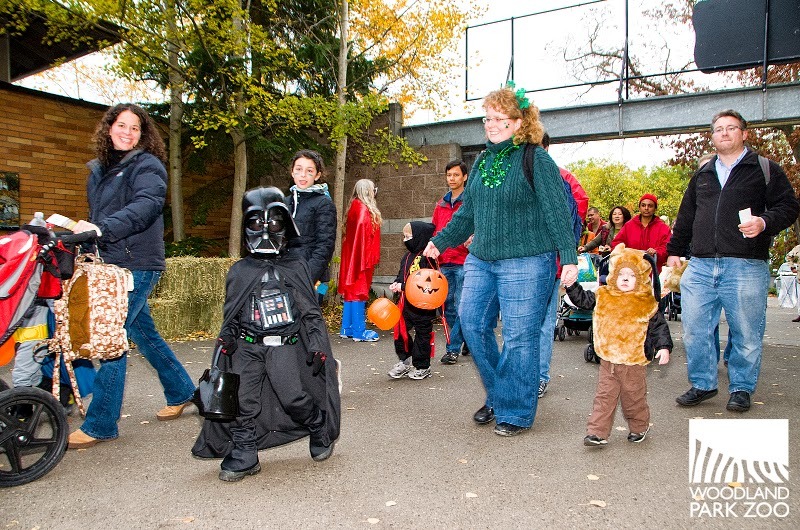 Halloween comes to Woodland Park Zoo with Pumpkin Bash presented by Delta Dental of Washington just around the corner—coming up Oct. 26 & 27. Please, oh, please let there be fishes in this pumpkin. Photo: Kirsten Pisto/Woodland Park Zoo. 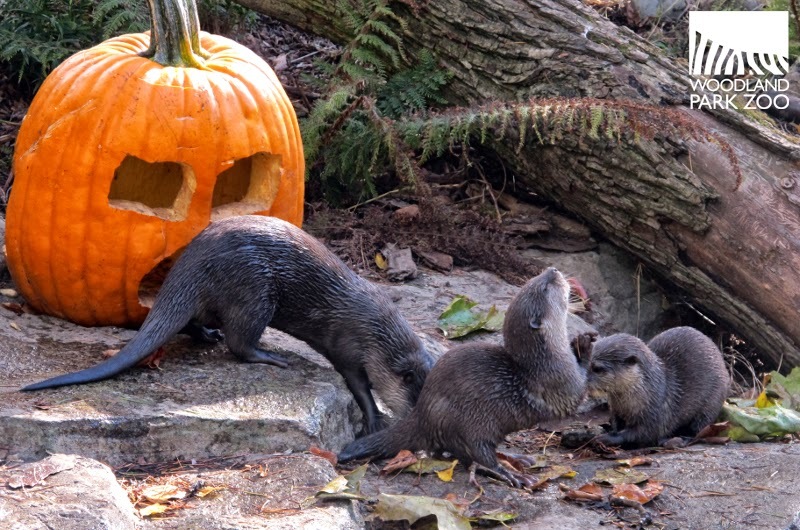 Pumpkins for the animals, trick-or-treating, and more are in store for little goblins and ghosts at Woodland Park Zoo’s family-friendly Pumpkin Bash. See how pumpkins bring out the animals’ wild instincts as hippos chomp, elephants smash, meerkats dig, and bears crunch their way through the festive treats. Activities free with zoo admission or membership. Exclusive Discount: During Pumpkin Bash, one child 12 years and under in costume is admitted FREE with a paid adult (cannot be combined with any other discount or promotion). Need a jumpstart on a Halloween costume? 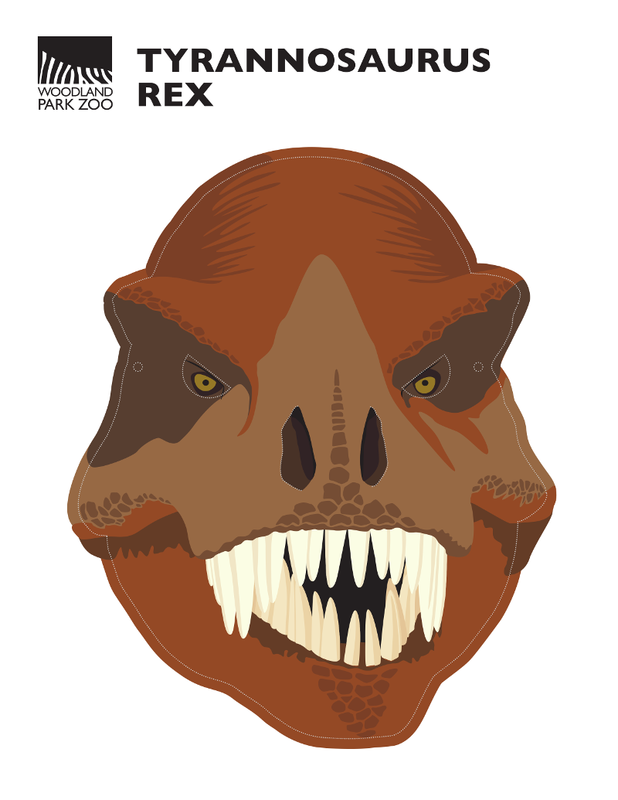 Download one of our free masks and get crafting on a DIY animal costume. You'll also find Facebook cover photos free to download that you can use to get you and your friends in the Halloween mood! 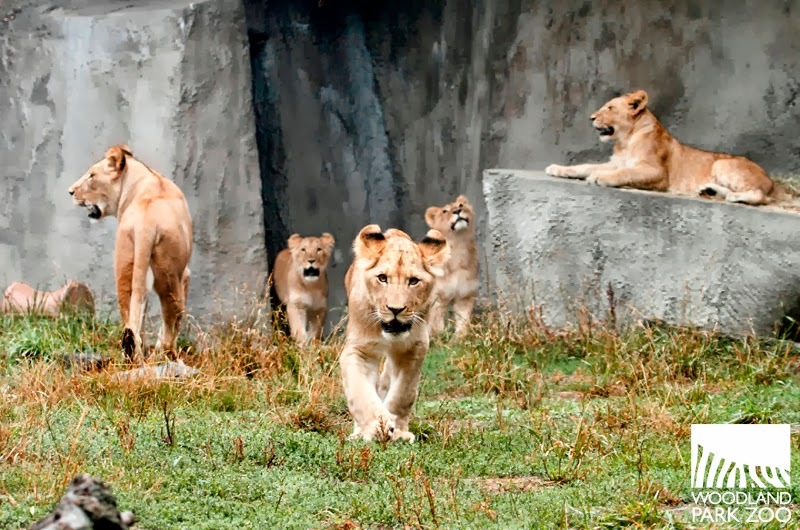 The lion cubs' first birthday is just weeks away, coming up November 8. The growing quadruplets have come a long way since their debut. 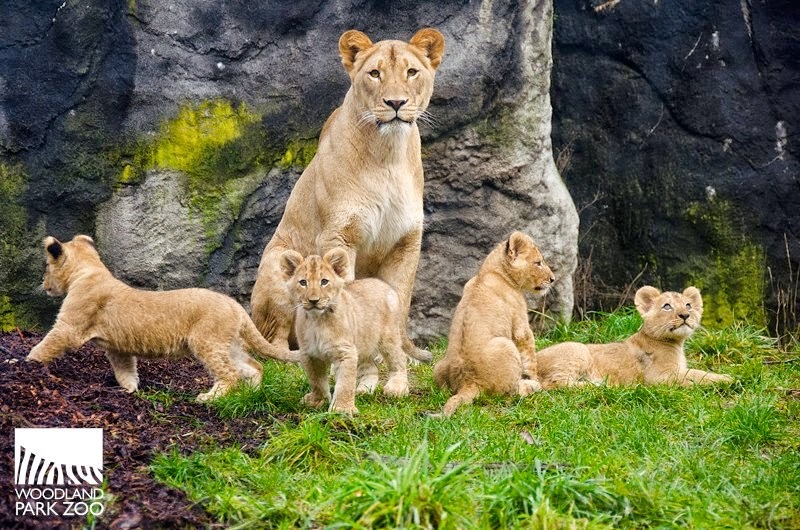 Top: The lion cubs on their first day outside at 3 months old, photo by Ryan Hawk/Woodland Park Zoo; Bottom: Now 11 months old, the lion cubs strut with confidence, photo by Dennis Dow/Woodland Park Zoo. They are coming into the age now where they would begin to hunt. Those predatory behaviors we've watched them develop through play are starting to become more honed and skilled. Take a look at those no-joke claws. 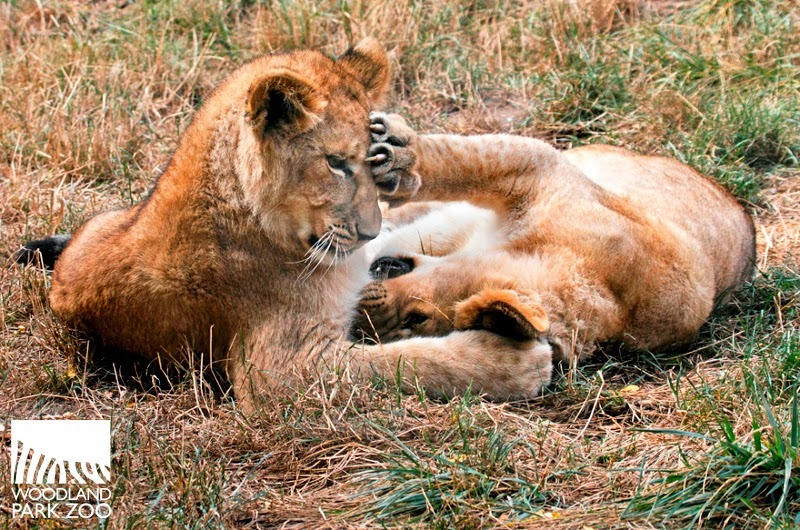 It is easy to tell the two girl cubs, Nobuhle and Busela, from their two brothers, Pelo and Rudo, now that the boys are beginning to grow shaggy, starter-manes. Think of a teenage mustache—it's a good start, but doesn't amount to much yet! They'll keep growing their manes through the onset of puberty. It'll take about 5 years to grow in a full, lush mane like their father Hubert's. 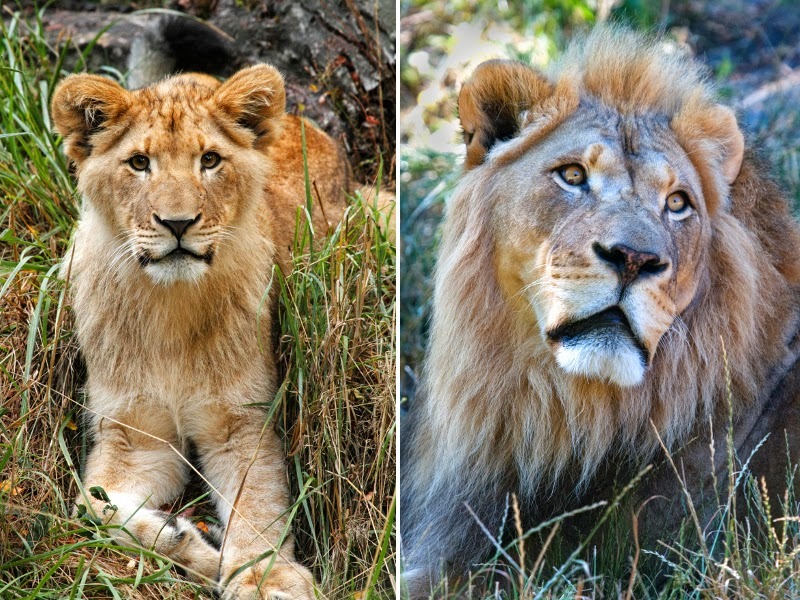 Left: A young male cub; Right: Cubs' father, Hubert. 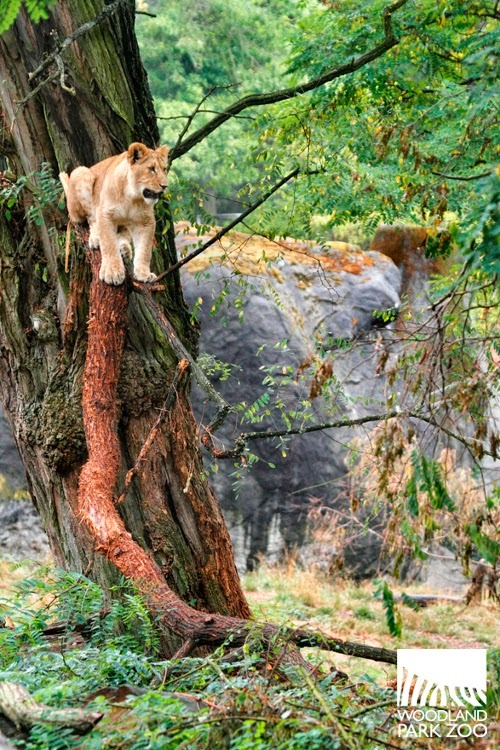 Photos: Dennis Dow/Woodland Park Zoo. One thing all the cubs have in common is a sense of adventure. We could tell from their earliest days that the foursome were a curious and athletic bunch. Sure they may spend most of their time snoozing like big cats always do. But when they do play, they play hard. You might find the cubs taunting gravity with some high climbing acts. It’s been fun watching them go from tentative, wobbly climbers to master balancers dashing across the log ramps in their exhibit. There was a time, too, when we worried how they’d fare next to the watery moat. Now they maneuver around it with confidence. Before you lament how fast they've grown, look for those tell-tale baby spots on their fur, something they will grow out of eventually but will carry for some time longer. Those little spots will be our reminder of their tiniest days and how we've watched them become the stunning cats they are now. For mom Adia, though, the four are still very much her babies. They might be maturing, but they haven’t outgrown her yet! On their first birthday in November, we’ll give each cub a gift-wrapped box with a yummy treat hidden inside—something to nibble on besides each other. As the cubs continue to grow, we’ll have to start making plans for where they will move onto eventually within the next year so that they can become part of the Species Survival Plan, a conservation breeding program for this species across accredited zoos. Though it will be hard to say goodbye down the road, what a treasure it has been to watch them grow. Our little ones will someday bring new cubs of their own into the world, and continue to inspire future generations to love nature and do something to protect it. 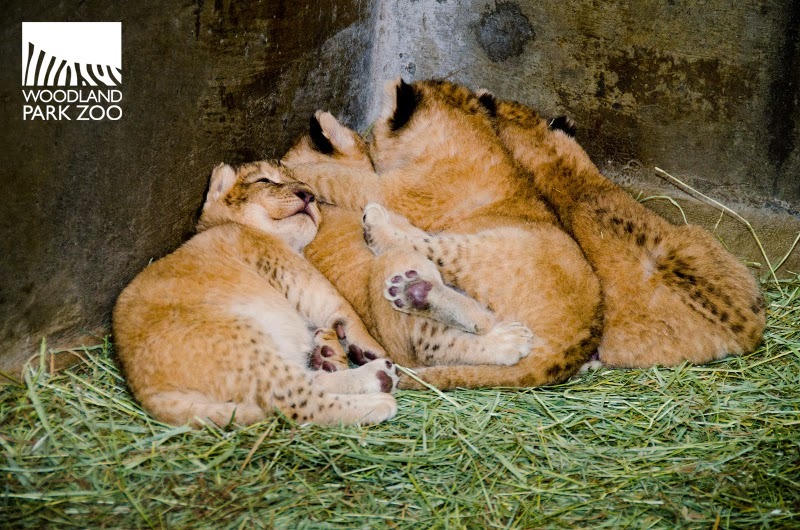 We leave you now with this photo of a pile of cubs from when they were three weeks old. Just because. Did you know that whenever you buy a 12 oz. bag of Caffe Vita's Zoo Special Reserve coffee, Caffe Vita donates $1 of every purchase to Woodland Park Zoo? We love their commitment to helping the environment, which is why we serve this shade-grown, organic and Rainforest Alliance-certified coffee here at the zoo, too! Now through the month of October, when you buy a 12 oz. bag of Zoo Special Reserve at any Caffe Vita location, you will automatically be entered to win a Woodland Park Zoo Family Fun Pack good for two adult and two child zoo admission tickets to keep or to share! 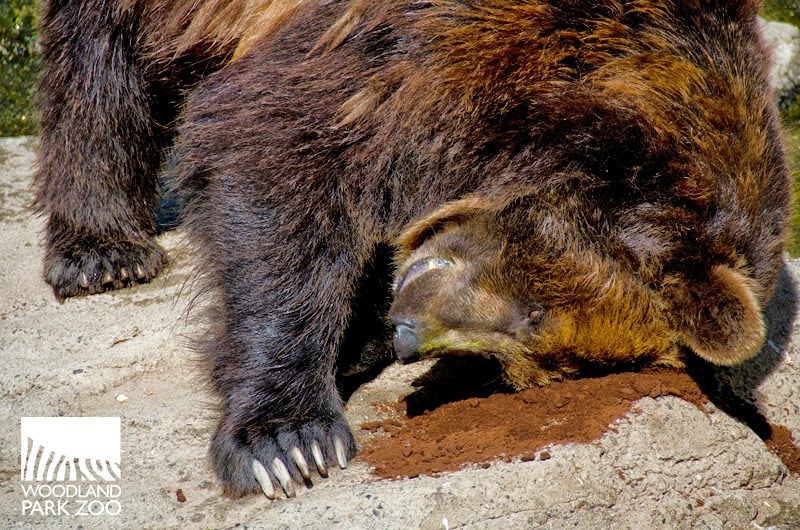 We recommend drinking the coffee, but the grizzlies have other ideas about the best way to use those grounds. 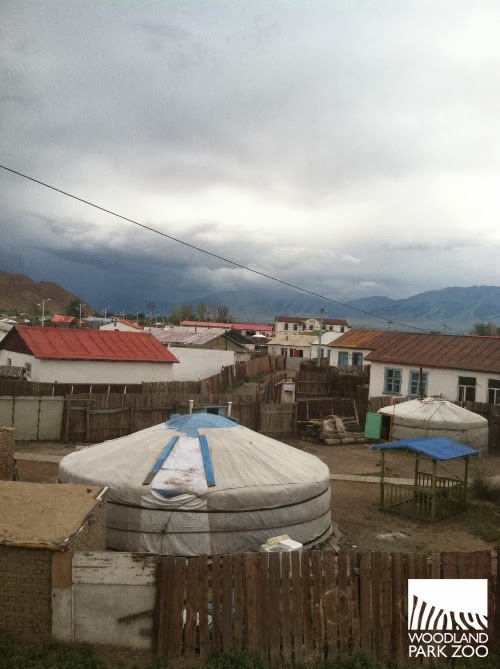 Editor’s Note: In this final installment, ZooStore manager Terry Blumer takes us inside the conservation commerce workshops in Mongolia he recently helped lead for local artisans, creating an eco-friendly income alternative to poaching in snow leopard habitat with the zoo’s conservation partner, the Snow Leopard Trust. See parts one and two to catch up with Terry’s travels and understand the role of conservation commerce in the zoo’s conservation mission. Four large work areas, lots and lots of wool and fifty-plus people make for an action packed and fun-filled day! Well, actually, five days—but time passes quickly when you are working hard AND having fun and that is exactly what we've been doing. Introducing new ideas and discussing techniques and topics is challenging enough in one language and twice as lengthy and challenging when going through a translator. Challenges aside, this is important work. We’ve come here with the Snow Leopard Trust to help expand the line of conservation commerce handicrafts made by these local craftspeople that are then sold through the Trust’s Snow Leopard Enterprises, Woodland Park Zoo’s ZooStore, and other markets, bringing money back into these communities. The point is to offer an eco-friendly income alternative to poaching in snow leopard territories, and the success of these efforts to date is what has brought us here—it’s time to expand the program, develop new techniques for better efficiency, and explore new products and styles to keep the crafters’ business thriving. Our mornings start out with informal but structured visual presentations on the history of the partnerships between the herders, the Snow Leopard Trust and Woodland Park Zoo. Then we break for morning tea. Each tea break is a new treat as each of the groups has brought along their favorite hot beverage mix and snack to share. Tea is a loosely applied term referring to either powdered instant coffee mixes or true tea bags. Snacks range from wafer cookies to biscuits and dried cheese curds. The Swiss, the French and the Wisconsinites have nothing on the Mongolians when it comes to intense passion for their cheeses! Who knew that dried cheese curds came in such a variety of shapes, sizes and range of flavors? Who knew they went so well with instant coffee or Buckthorn berry tea? 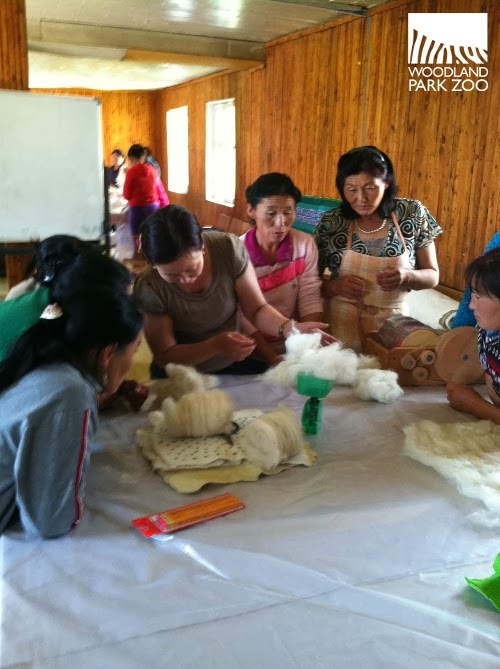 For seven to eight hours each day, we all worked diligently on teaching, learning and refining techniques for felting handicrafts that can be sold as conservation commerce. Participants were shown how to weigh wool so that they knew specifically how much wool is needed to create a specific item. This is a valuable tool that helps them manage their own raw wool inventory and gives them a base to calculate and develop their personal businesses as craftspeople. It also assures higher quality and consistency for each product. 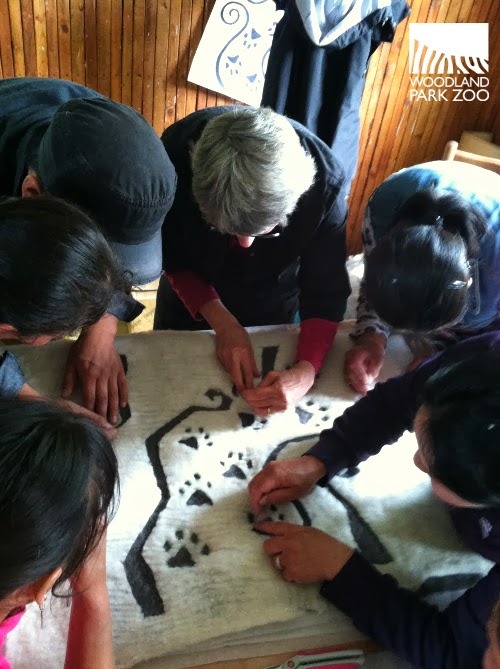 With greater consistency in production, the crafts folk have the potential to increase their business and the Trust will have a stronger product line to promote for them, thereby creating a win-win situation for the producers, their communities, the Trust and MOST importantly, the snow leopards! One of the most rewarding things for me to witness is the openness and collaboration between all involved in the workshop. As an artist myself, I can relate to the creative process and with it the sometimes difficult challenge of letting go of one's designs. Imagine a scenario with five designers, all of whom have been working for months to develop new designs, coming to teach the basic techniques to the crafters and then having to let go and watch the students take off with it. It is difficult to capture in words the dynamics of a room full of energetic and enthusiastic artists. I can only hope that the pictures help convey that—despite the language barriers—each day unfolded into a new and exciting collaboration as old stitching traditions were renewed and reworked to capture, simplify or improve a design. The participants taught the trainers just as much as they had received, and in the end, the new product samples are highly encouraging. After seven, hard-working days in the shadow of beautiful Turgen Uhl peak, our workshop ended with a celebration but not before a conservation-focused service project where we all donned rubber gloves and spent an hour or so cleaning up the stream bed and surrounding grounds. 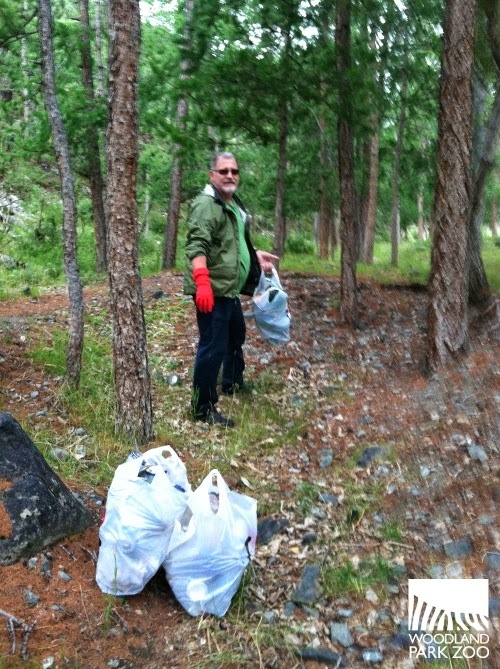 In the end, many bags of trash, broken bottles, rusted cans and more were removed from the watershed. It was a positive note to end a successful workshop. The ever-generous and hospitable Mongolians strategically kept our training delegation away while they set up a nearby hall for a farewell party. The appearance of some government secret service piqued our curiosity and we eventually found out that the Prime Minister himself was slated to visit that evening. Apparently he was born in the region and was making his annual tour to inspect the parks and the roads. In a feat of irony that only Mother Nature can provide, a late-afternoon thunderstorm and subsequent deluge washed out part of the road, so unfortunately no P.M. sightings occurred. The party went on as planned and after much toasting and serenading (by each community), parting gifts were exchanged, someone hooked up their playlist and we all danced, laughed and said our heart-felt goodbyes. The following day dawned clear and sunny and shortly after leaving the camp it became readily apparent that the wash-out that foiled the Prime Minister's visit was indeed very real. So real in fact that we almost couldn't get back to Ulaangom ourselves. Our resourceful driver managed to maneuver around the 20 foot wash-out, we got back to town, and I enjoyed my first real, albeit cold water shower in over a week! Lake Uvs is the largest lake in Mongolia and the second largest lake in Eurasia. It is broad, shallow and four times saltier than the ocean due to its land-locked location. It is surrounded by critical wetlands, borders Russia and carries Mongolia's "Highly Protected region" status. It is also a popular local recreation area. In a ride comparable to Mr. Toad's infamous wild ride, we piled into the tiny van and rocketed across the flatlands to the lake. After a relaxing swim/float and a culturally appropriate vodka offering to the lake spirits, we toasted our successful workshop and our newly forged friendships. The remaining two days in the enigmatic and beautiful country of Mongolia mostly involved crossing the vast countryside, meeting the rest of the hard working Mongolian Snow Leopard Trust staff and, of course, picking up a few things at the State owned department store for the folks back home. If all goes well this winter (and there is no reason to expect less), the Mongolian crafters will be delivering many new product samples and eventual additions to the existing line including felted bowls, new ornaments, pet mats and slipper designs. Be sure and check in with the ZooStore to see them!